Chinese vehicle manufacturer Beijing Automotive Group (BAIC) and South Africa’s Industrial Development Corporation (IDC) on Tuesday announced the establishment of a new vehicle plant, to be located in the Coega Industrial Development Zone (IDZ), near Port Elizabeth. 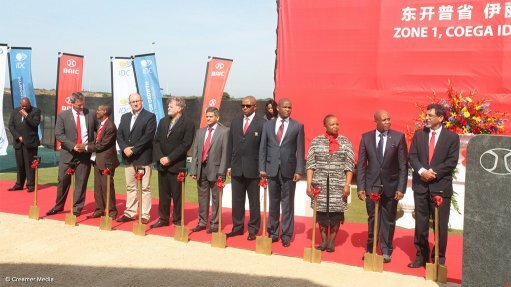 It will be the first new car plant to be built in South Africa in 40 years. At full capacity, the R11-billion joint venture (JV) plant will be able to produce 100 000 vehicles a year. BAIC will be the major shareholder, holding 65% of the venture. The IDC will hold the remaining 35%. “We are extremely excited to announce a deal of this magnitude and economic importance to the country,” said IDC CEO Geoffrey Qhena at the Coega IDZ. He said the JV would roll out in two phases. The R4.25-billion first phase will have the installed capacity to manufacture 50 000 units a year. This is expected to double in Phase 2. The plant should reach its 50 000-unit capacity by 2022, anticipated BAIC Automobile South Africa JV chairperson Dr Haiyang Dong. The implementation of Phase 2 should be completed by 2027, according to current planning, he added. The plant will be located on 47.3 ha of land, under a covered area of 88 969 m2. The first phase will include a body shop, paint shop and assembly line. It will produce a small car, small sports-utility vehicle and pickup – three of the most popular vehicles in South Africa. BAIC has set a target of 60% local content for the vehicles to roll off the Coega assembly line, with the parts to be sourced from new and existing component manufacturers in South Africa. Plans for the BAIC plant include the future construction of a supplier park in the Coega IDZ to facilitate parts supply to the assembly line. Local component makers are to supply steel chassis components and assemblies, panel and pressed components, interior and exterior trim, wheels and tyres, automotive glass components, and electrical and electronic components. Construction of the new plant, which would start in December, was expected to be completed in the first quarter of 2018, said Qhena. More than 2 500 jobs will be created during the construction phase. Around 1 000 people will be employed in the plant during Phase 1, with another 10 000 jobs to be created throughout the automotive value chain. The first vehicle to go on sale in South Africa will be the D20. The hatchback is undergoing homologation and should go on sale later this year. BAIC intends to establish 25 dealers during its initial roll-out in South Africa, which it believes will cover 90% of the available market. BAIC chairperson Xu Heyi said the plant was central to the company’s global expansion plans, with exports from South Africa to flow to sub-Saharan Africa and North Africa, and also eventually Europe. Exports to Europe would have a focus on “new-energy vehicles”, said Dong. “Our dealings with our local partner, the IDC, and with government and industry leaders, fill us with confidence that South Africa, and the Coega IDZ in particular, is the right place to be,” noted Heyi. BAIC is China’s fourth-largest automotive company by sales and revenue, generating more than $53-billion in income in 2015. The group’s brands include BAIC Motor, Foton, BBAC, BHMC and CHANGHE. It is also the official manufacturer in China, through JVs, of Mercedes-Benz, Suzuki and Hyundai vehicles.